A magnetic fastener holds everything in place! Not all fasteners are created equal. 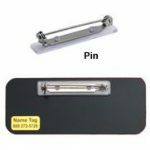 As our most popular fastener choice, the deluxe magnetic fastener is an excellent choice for almost every name tag! 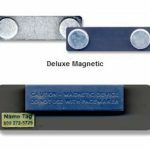 This magnet fastener consists of two parts: a metal plate with indentations and a plastic bar that holds two strong magnets. 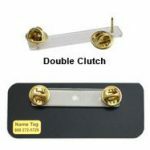 The plate holds the magnet in place and adheres to the back of most name tags. And the bar holds everything together and in place through multiple layers of clothing. Our deluxe magnetic fastener is the highest quality fastener available. The strong magnets attach easily, even through thick clothing, while preventing holes and clothing damage. Among the many fastener types offered, the deluxe magnets are best for wearing with professional clothing as they do not leave holes. Something to consider when ordering name tags for your company is that these fasteners work great on loose clothing or expensive fabrics. Unlike pins, they do not leave holes or snag on softer pieces. 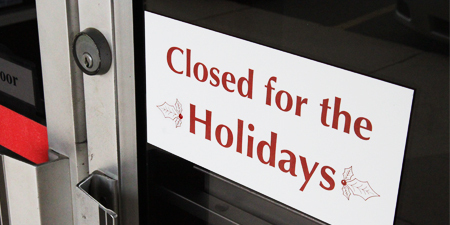 Magnets also give employees the opportunity to wear a single name tag with different uniforms or clothing choices. Wear one on a shirt collar or pocket. Try one on a jacket or suit coat. 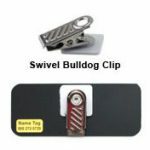 Wherever is most convenient to wear it, a magnetic fastener will make sure that a name tag is instantly visible. We offer two choices for magnets. We have them available with or without our logo to match your needs and style. And, there will never be another worry about losing a name tag. These magnets are strong enough to ensure all day wear without any damage to your clothing. Does anyone ever really consider what it takes to produce that name tag they are wearing? When considering a name tag the first thing that usually comes to mind is typically the name that appears on it. 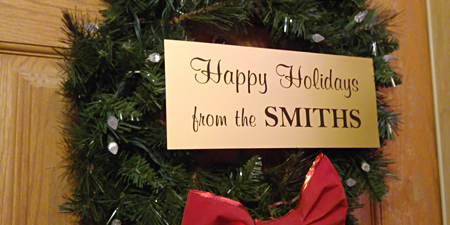 However, there is so much more to consider when looking at name tags. Name Tag, Inc. opened my eyes to what really goes into producing a name tag. When wearing a name tag one never really thinks about all the work, the people involved or machines used to make it. When first looking at a name tag the color, the person’s name and title, and the logo are what really stand out. Not much else is really considered. As part of customer service, my view has definitely changed on what goes into making a name tag and the process behind the scenes. A lot goes into setting up orders, sending out proofs and working with design worksheets. There are so many colors and materials and different ways to put a name tag together. This may sound weird, but I feel like I help make name tag dreams come true. Orders start with an internet order or a phone call. Once the specifics are laid out by the customer, the design team goes to work. Sometimes a customer has an image from the online design tool which provides a more visual picture of the “dream,” and sometimes only simple instructions like size, color and logo placement are included as instructions. Whatever the case, all customers end up with a PDF proof showing them what the name tags will look like. Once a proof is seen, all the extras and smaller details begin to take shape. 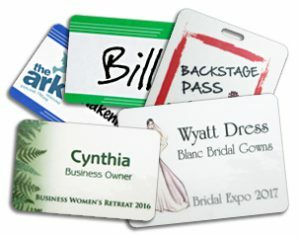 Many customers have questions at this point, such as the tag size, the option of an epoxy dome, or adding a name tag frame. All these options come highly recommended, and while they do add a minor cost to the name tag purchase, the end results are worth it. 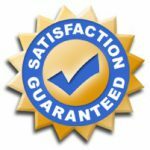 Once the proof has been approved by the customer, the order is sent to a quality checker to make sure that all the order information is correct and consistent. Then, when the order passes this check, the production team takes over. There are various machines that make different name tags. 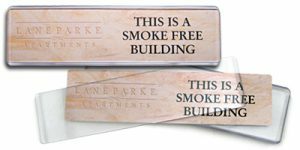 Laser engravers are used on both plastic and metal materials to cut and engrave names, titles and logos. There is also a full color print machine that prints in vibrant colors. Each name tag is carefully completed according to the specifications that were check and rechecked in customer service. Part of production is assembly of the product. 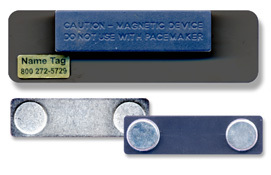 Fasteners, such as magnets, are affixed to the name tag. Before any name tag is shipped, two more quality control people review the order again. Once this is complete, the package is sealed and given to a trusty UPS driver who then gets them delivered directly to the customer. Now that’s a lot to think about and consider when looking at a name tag! So, the next time you see a name tag, I hope that you can take a moment to reflect about all the hands and time (and care) that went into its production.